^ The Metropolitan Museum of Art. Heilbrunn Timeline of Art History: Japan, 1900 a.d.–present. [2009-02-01]. （原始内容存档于2009-06-18）. ^ 9.0 9.1 HC Deb（英语：Hansard） 04 May 1955 vol 540 cc1871 （英文）. "The case of Formosa is different. The sovereignty was Japanese until 1952. 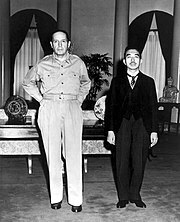 The Japanese Treaty came into force, and at that time Formosa was being administered by the Chinese Nationalists, to whom it was entrusted in 1945, as a military occupation." ^ HC Deb（英语：Hansard） 04 February 1955 vol 536 c159W （英文）. "Under the Peace Treaty of April, 1952, Japan formally renounced all right, title and claim to Formosa and the Pescadores; but again this did not operate as a transfer to Chinese sovereignty, whether to the People's Republic of China or to the Chinese Nationalist authorities. Formosa and the Pescadores are therefore, in the view of Her Majesty's Government, territory the de jure sovereignty over which is uncertain or undetermined." ^ HC Deb（英语：Hansard） 04 May 1955 vol 540 c1872 （英文）. "It is clear from what Mr. Dulles said at the time of the signing of the Treaty that he was in no conflict with us on the legal interpretation of the position. 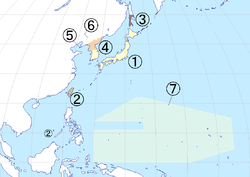 Mr. Dulles at a Press conference on 1st December was reported as saying when he was asked whether the legal position of the coastal islands was different from that of Formosa: “The legal position is different by virtue of the fact that technical sovereignty over Formosa and the Pescadores has never been settled. That is because the Japanese Peace Treaty merely involves a renunciation by Japan of its right and title to these islands. But the future title is not determined by the Japanese Peace Treaty; nor is it determined by the Peace Treaty which was concluded between the Republic of China and Japan. Therefore the juridical status of these islands, Formosa and the Pescadores, is different from the juridical status of the offshore islands.”"